Going into my 15th year as a teacher, I have been through a lot of staff meetings. This may surprise you, but they are not a highlight of my job. In fact, I never found them particularly helpful in my practice. Most of the information in typical staff meetings I have sat through could have been sent in an email. With the change of the role of a principal into a lead learner, instructional coach, and leader why not take the time you have at staff meetings and transform them into innovative, collaborative, relevant work time for your teachers? Education in our nation has come upon transformative times. We are handling issues we have never been faced with, yet are trying to deal with them through our old traditional manners. Our way of delivering information to our teachers is one-sided, one-directional, and too instructional to meet the needs of the constantly evolving classroom. Not only that, time with our teachers is extremely limited; a precious resource that we need to learn to use efficiently, effectively, and wisely. Three years ago my two principals and I were faced with an oncoming initiative in our middle school: a 1:1 digital transformation. Although exciting, we knew a 1:1 program required an immense amount of preparation, professional development, and change in order to see success. At that time none of our teachers had devices, widespread digital experience, or a clear understanding of digital teaching and learning techniques and approaches. We have limited time built into our school year schedule and a professional development model where the individual has no personal exploration and learning responsibilities. We also couldn’t expect teachers to be able to do all of this on their own time nor did they have the resources to do it. We knew we had to do something different to take on the challenge of preparing them for such a drastic change. We had to get innovative and find a way to help train, prep, and ready the teachers for a digital transformation. Flipped classrooms are not new and have been used successfully for years. So we thought, why not use the same concept with teachers? We could gain precious time that we needed with the teachers by taking the meetings we had throughout the year and removing all informational pieces. By putting these items in a screencast that we send to the staff a week before the meeting, we free up time to work together on initiatives like our digital transformation. 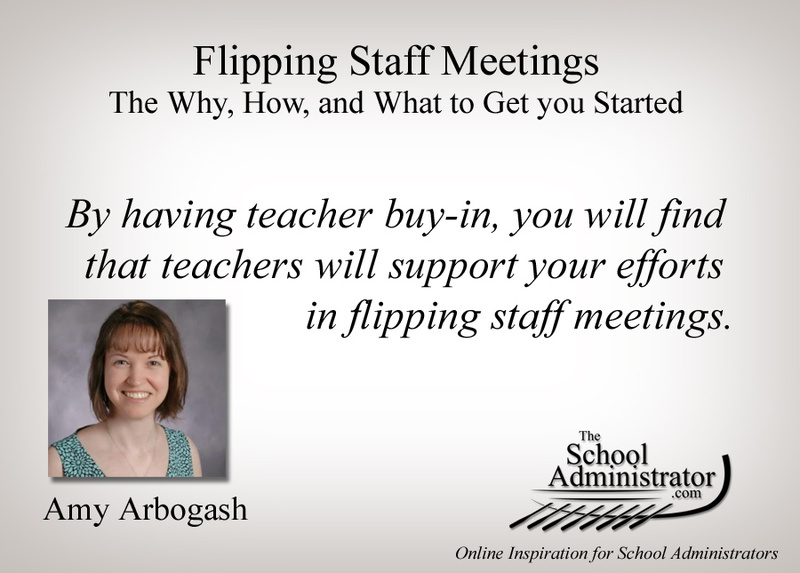 The idea of flipping is not difficult, but figuring out what to actually do during the staff meetings becomes the challenge. You will need a vision of what your building and teachers need. You may have that vision, but include your teachers as well. Ask them not only to help with the vision, but also with the responsibility of the staff meeting. Find a way to give them choice and leadership opportunities. By putting together a leadership team, you will build your capacity for the workload as well as the expertise. 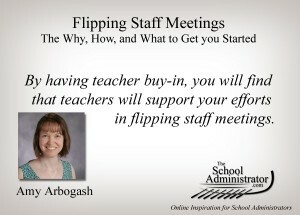 By having teacher buy-in, you will find that teachers will support your efforts in flipping staff meetings. They will come to realize that the small amount of work outside of the staff meeting (primarily the screencast that needs to be viewed) is not really a hardship. The teachers will begin to feel that staff meetings are the place to be engaged in meaningful, relevant, collaborative, and active professional development. And you will be modeling for your staff the type of classroom setting you’d like to see. There are three parts to a flipped staff meeting: the planning, the flip, and the staff meeting. Honestly, this part is the most difficult. Here is where you need to figure out what you are going to do with the time you gain by flipping your staff meeting. Our school has used this time to effectively implement Google Apps for Education, Schoology, 1:1 classroom iPads, flipped and blended learning, SAMR, self pacing, Twitter, and even our new school safety program. The options are unlimited; be creative. Take my advice and involve your teachers in the choices, in the workload, and in the responsibilities. We usually do this planning a few weeks prior to the staff meeting in order to have time to do any needed work. Once you have your initiative(s) selected, work with your leadership team to determine the best way to use the time you have together. Just like any good classroom, make sure you incorporate collaboration and active learning. You might even be able to include choice within the staff meeting itself. We have done conference-like staff meetings where teachers teach teachers and choose what they want to learn about. After you have planned for your staff meeting, work with the leadership team to divide up any work that needs to be done. The week prior to the staff meeting, we determine what information needs to be sent to the staff. We use Google slides to prepare the information. This information includes anything the whole staff needs to know that you would typically talk about during a staff meeting (due dates, news, etc.) and any prep work the teachers need to complete prior to the meeting. For example, when we taught our staff about Twitter, the prep work included signing up for Twitter before the meeting. The Google slides are then used to create a screencast where we talk through the information. We generally use Quicktime (we have Macbooks) but we have also used Screencast-o-Matic. After the screencast is created, it is uploaded to YouTube and sent to the teachers. They are asked to watch it and complete any necessary prep prior to the staff meeting. These videos are never longer than 10 minutes, and in the beginning, we shortened our staff meetings slightly to account for that. We no longer do that, in fact teachers often stay well after the staff meeting is over! This is when you see all of your work come to fruition. We usually have a five minute intro with the staff to answer any questions, and then we implement the plan for the meeting. This is often a time for administration and the leadership team to facilitate and listen to what is going on around them. It helps to get feedback during and after the meeting to continue your progress. Knowing what is working in your planning and what you can improve on will help you to become more and more successful with flipping staff meetings. Flipping staff meetings can be challenging, but when you realize what you can accomplish during the time you have together with your staff, it is well worth the work. You’ll gain teacher leaders, model effective classroom practices, and engage your teachers in meaningful work that will lead them through these transformative times. 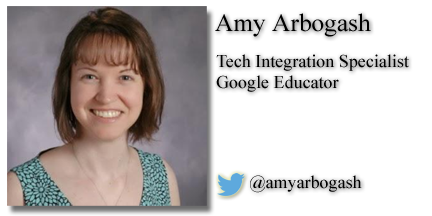 Amy Arbogash is a Tech Integration Specialist and a Google Educator. She shares her insights on her website, Blazing the Trail of Innovation. 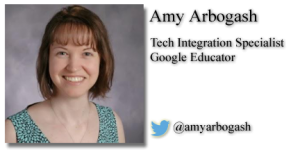 Follow Amy on Twitter at @AmyArbogash.